Unsolicited Opinion – thoughts of an app developer on apps, design, and life. thoughts of an app developer on apps, design, and life. Can you use a 60W/61W USB-C Charger on your 15-inch MacBook Pro that requires 85W/87W of power? There is a lot of uncertainty when it comes to using a lower wattage charger to power or charge devices that draws a higher wattage. Some people claim it will fry your charger, others say it will fry your device. The trouble is that there is little authoritative guidance from Apple. Ask ten Apple Geniuses and you will get ten different answers. Conventionally, it is OK to use a higher wattage charger to power a device that draws a lower wattage (e.g. using a 87W charger to charge a MacBook 12-inch that typically draws 29W), but not the other way around. However, when it comes to USB-C, is there any difference? I recently got hold of the LG 27UD88. It is a nice 4K monitor that comes with USB-C connectivity. The neat thing about USB-C is that it can deliver video, data and even power over a single cable. The 27UD88 supplies up to 60W of power, which can power and charge my 29W 12-inch MacBook without issue. However, my wife’s 15-inch MacBook Pro draws up to 85W of power and typically uses a 87W charger. Since power delivery is not something that I can disable, I was worried something bad may happen when using the 15-inch MBP with the monitor. It turns out though, Apple has given official guidance on using lower wattage USB-C charger to power the 15-inch MBP. When Apple launched the MacBook Pro, they also collaborated with LG to launch two pricey monitors—the LG UltraFine 4K and 5K Display. The 5K Display delivers 85W of power, but the 4K display only delivers 60W of power, like the 27UD88 that I’ve purchased. Since these monitors have been officially endorsed by Apple for use with the new MacBooks, I wondered what Apple had to say about using the LG UltraFine 4K with the 15-inch MacBook Pro. The UltraFine 4K won’t fully power 15-inch MacBook Pro from 2016 and later, which requires 85W. If you try to power your 15-inch MacBook Pro through the display, your notebook’s battery will be utilized during times of heavy activity. To fully power your MacBook Pro and charge its battery, connect your 15-inch MacBook Pro to its Apple 87W USB-C power adapter when you use it with the UltraFine 4K. So in short, you may experience your battery draining when using the 15-inch MacBook Pro with the LG 27UD88, but it won’t fry your MacBook Pro or the monitor. I’d extrapolate that to say that it is OK to use the lower wattage 61W USB-C charger on your 15-inch MacBook Pro as well. If you have to, that is. Look for something less than one-year-old so you have the chance to purchase AppleCare for the Mac. Caveat Emptor. If something does go wrong, you’re not going to be able to go after the seller. Your best bet is Apple. The following is my checklist when buying a second-hand Mac. It’s meant to run through sequentially so that you can rule out listings without wasting too much of each other’s time. For example, if the price is not right, don’t bother asking the seller for more information. Ensure that the asking price is within your expectation, or negotiable if it’s not, before proceeding down the list. If it’s negotiable, do your homework to find out the average asking price for the same model of Mac. You may not want to start negotiating until you’ve gone through the remaining questions. See if the seller lists any physical defects. Scratches are fine for me; chips and dents usually indicate knocks and drops. I’d avoid them. If the seller doesn’t list any physical defects but a condition like 9/10, asks why the seller rated it 9 instead of 10. Ask whether the original receipts are still available, and if the seller will provide it to you on purchase. 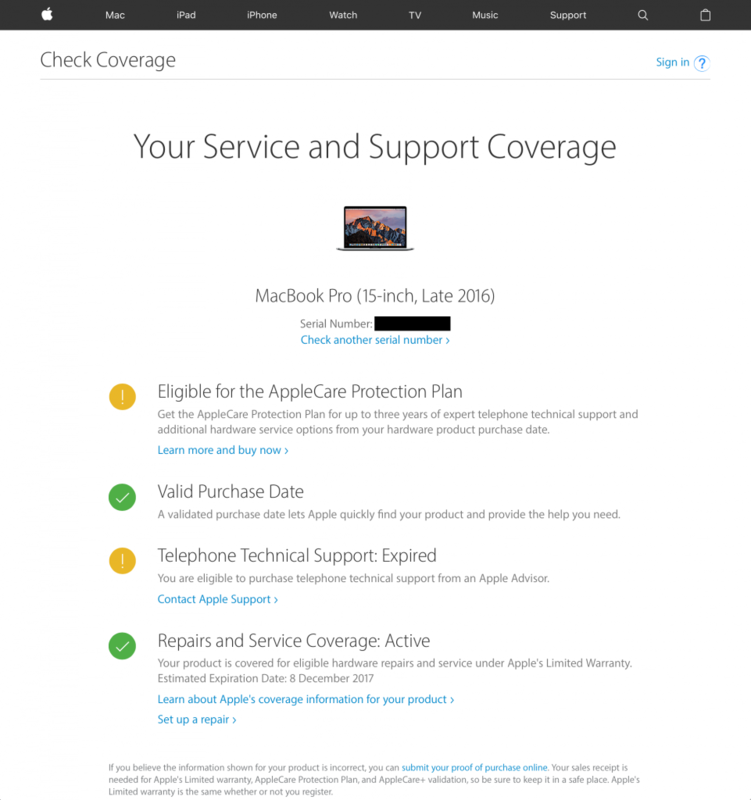 According to Apple, the AppleCare confirmation document and original sales receipt are required “if there is any question as to your product’s eligibility for coverage”. Ask for the Mac hardware serial number and check it against Apple’s database to verify if it’s still under the one-year warranty, or if AppleCare has already been purchased for the Mac. If you’re buying a laptop, ask for the battery cycle count. Batteries have limited lifespan, and a laptop that needs to be tethered to power all the time is not useful. For a laptop less than a year old, you should look for something less than 100. Apple says its recent laptops have a maximum cycle count of 1,000; I’m not too sure about that. Ask if all original accessories (e.g. charger, keyboard, mouse, trackpad) will be provided. If the seller even has the box available, there is a good chance he took good care of the Mac. If everything is good, then ensure that the seller is agreeable for you to inspect the Mac for about 15 minutes before confirming the purchase. Arrange to meet at a location where you can do so. For a desktop, that probably means at the seller’s home where you can plug it in for testing. Many sellers protect their laptops with sleeves and screen protectors, I’d ask the seller to remove them before the meet-up if possible. If not, he should be prepared to remove it during the meet-up for inspection. Check the Mac hardware serial number to make sure it tallies with what you were given before. Check the battery cycle count to make sure it tallies with what you were given before. The cycle count may increase by 1–2 if the seller continues to use the Mac. While you’re checking your battery cycle count, also ensure that the Condition listed under the Cycle Count is Normal. Open TextEdit in full screen and check the display for anything strange. Type on the keyboard to make sure it functions correctly. Bring a USB thumb drive to check that the USB ports are working. If you’re buying a recent Mac with USB-C ports only, then you’d need either a USB-C thumb drive or a USB-C to USB adapter. Check the iSight camera, microphone and speakers by recording a movie with QuickTime Player and playing it back. The final test before you hand over the money is to run Apple Diagnostics on the Mac. This will probably take a while. On a MacBook 2016, it took me less than 10 minutes. And with luck, you’d bring home a good Mac while saving some money. Apple users are ordering more iPhones than they need. Not because they need one in each pocket, but because they want to resell the phones for profit. Android users too are rushing to pre-order the new iPhones 6. Not because they’re switching to Apple, but because they too know that they can turn a profit by reselling these phones. Recently, my friend told me about how people are offering to buy the new iPhones 6 at a premium over Apple’s prices. These buyers offer the highest prices for your iPhones 6 on launch day. Then, the offer price decreases with each passing day. How strange it is that the same, exact iPhone 6 is worth a few hundred dollars more than it will be a week later. When you think about it, it’s crazy that an entire market can not only exist, but thrive, by preying on consumers’ desire to be the first to own something. I too tried to pre-order the iPhone 6, but to no avail because of problems with my telco’s system. Hundreds of pages of forum posts have spawned discussing the availability of (or more like the lack of) the new iPhones. In them, angry customers have rubbished the telco and its staff, and spewed expletives at them. When you think about it, it’s crazy that we’re losing sleep, losing cool, just because we’re getting the phones a few days later than others. I never saw Google commercials mocking Yahoo!. I never saw Facebook taking potshots at MySpace. Those throwing stones now should do what the big guys did to get here—focus on their business and do a fantastic job executing on something users really want. The classic corporate structure does not encourage people to continue to do things that they’re good at doing. If you’re a teacher in Singapore and if you harbour any thoughts of advancing your pay or career, you’d need to think about teaching less and taking on more responsibilities, such as becoming a subject head, a head of department, or even a principal. Being a very good teacher just won’t cut it. And if you’re thinking of quitting your day job and doing something you love—but are having nagging doubts—Amy’s whole piece is a gem to read. It is simply common sense: If your workforce is happy and well-motivated, your customers are more likely to be happy as well – which means there is greater chance that your business will see strong sales and good profits, generating the results that your shareholders demand. [Make] sure that front-line employees are able to contact you, so that you and your team can act on their information. I recommend giving out your email address and phone number to all employees—they will only use it if they need to. Since the iPhone 3GS, you could tap on any part of the image in the Camera app to lock focus and exposure. The exposure and focus however shifts as you recompose your image. New in iOS5, you can finally lock focus and exposure on a spot and keep it locked even as you recompose the frame. But it’s not entirely easy to figure out how. Tap and hold on the spot for 2s until the focus box animates. The words ‘AE/AF Lock’ appears at the bottom of the screen as you let go of your finger. Best introduction to Objective-C. Mostly command-line (so it can be quite boring), but that takes away the distraction from learning the language as the learning curve is really steep (mostly in memory management). If you’ve some programming background, you don’t need to go through the entire book, and you’ll know which to skip. This runs you through the graphical user interface development (the fun part) on the iPhone. But I really recommend to start with Kochan’s book first as the language learning curve is steep. Having the GUI stuff coming in can be even more confusing for someone new to programming or Objective-C. Updated both title and and links with newer 2011 editions. This video by Omni Group on Designing Graceful, Gracious Interfaces for iPad is now sitting alongside the WWDC 2010 videos that I’ve downloaded and kept for reference.